Central and Eastern Europe: Austria, Bosnia and Herzegovina, Bulgaria, Croatia, Czech Republic, Estonia, Germany, Hungary, Latvia, Lithuania, Poland, Romania, Serbia, Slovakia, Slovenia, Turkey. We have all the data for this report already available and the report is 75% ready and is in completion stage. With each License, you will get an Excel sheet with all the quantitative information in up to 1 working day after your purchase, which will allow you to start working with the data immediately! The final version of the research report will be presented up to 5 working days after your order. The report will be updated as of the current month of purchase. Feel free to contact us for more information! 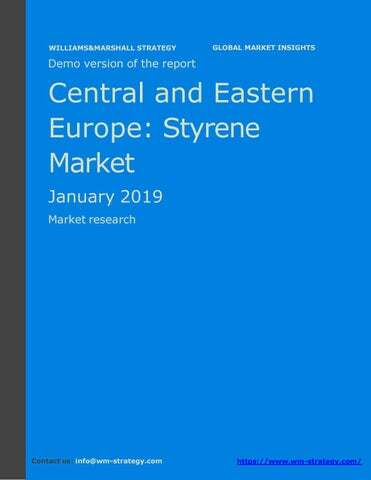 This is the most comprehensive report covering the styrene market in Central and Eastern Europe currently available! We also offer similar reports, covering every global country, region and the world as an overall and offer special terms for bundle purchases. So, if you are interested in the styrene market in Central and Eastern Europe, this research report will provide you with a strategic analysis of the market, its recent and future development. In addition, the report will save you time and money while presenting you all the necessary information, empowering you to make informed decisions and move your business forward! 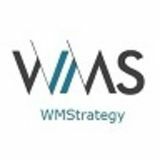 Research methodology The report on the Central and Eastern European styrene market uses the unique WMStrategyâ&#x20AC;&#x2122;s research methodology that combines quantitative and qualitative analysis. 6. Overview and analysis of the styrene market in Central and Eastern Europe 6.1. … In the medium term, the styrene consumption in the region is expected to grow the most in the production of …, which is expected to happen at a CAGR of …% per annum. It will be followed by the styrene usage for production of …, …, and …, which are forecast to grow at CAGR of …%, …%, and …% per year, respectively. The overall market volume is forecast to grow at a CAGR of …% per year to reach 2.290 million tons in 2023. 7. Overview and analysis of the domestic production of styrene in Central and Eastern Europe 7.1. As an overall, the Central and Eastern European production of styrene in volume terms showed mixed dynamics in the period 2013-2017. In 2013, in Central and Eastern Europe were produced 1.066 million tons of styrene. In the next year, the production increased by …%, which was followed by two years of decline. It happened at rates of …% and …%, respectively. In 2017, the production volume … by …% and reached … tons, which was its … value for the period. This was an overall … of …% for the last five years. Experts forecast that in the next few years, the Central and Eastern European production will … at … rates of …% per year. At the moment, in Central and Eastern Europe there are … styrene manufacturers. The report includes some of the leading manufacturers, ranked in terms of their overall installed capacities for the production of styrene as of 2017. … 7.5.1. BASF SE BASF is the world's largest chemical company in terms of revenues. The company operates through subsidiaries in more than 80 countries across the globe. Central to the company's operations is the Verbund structure. Verbund is BASF's approach to vertical integration, which involves linking plants in a production Verbund to create efficient value-adding chains from basic chemicals to higher value products. At Verbund sites, BASF uses by-products of chemical reactions, which might otherwise have to be disposed of, as raw materials for other processes. The company operates six Verbund sites worldwide, the largest of which is in Ludwigshafen, as well as 376 other production sites. The company operates in Europe, the Americas, Asia Pacific, Africa and the Middle East countries. … In the fiscal 2017, the company reported revenues, amounting to … EUR, which was a … of …%, compared to the previous year. As far as net income is concerned, BASF SE recorded … EUR, compared to … EUR in the fiscal 2016. … Table 10 Installed capacities for the production of styrene by BASF SE, broken down by countries in Central and Eastern Europe in 2013-2017, in thousands of tons and in % Prod. … The average annual prices of styrene in Central and Eastern Europe in the period 2013-2017 showed … dynamics. In 2013, one ton of styrene, purchased directly from the producer cost about … EUR in Central and Eastern Europe. In the next four years, the indicator recorded steady … with only one exception in 2014, when it … by …%. Its … rates in the other years were …%, …% and …%, respectively. So, in 2017, the average producer price reached … EUR per ton, which was an overall … of …% for the period. Experts expect that the average producer prices will … in the next five years at … rates of …% per annum. … Due to the high domestic supply, the domestic demand is … to cover it fully, so the local balance between supply and demand in volume terms was … with domestic supply being able to cover …% of the domestic demand in the last five years. In value terms, the situation was very similar, but had different dynamics due to the different per kilogram prices of the styrene, produced in Central and Eastern Europe and the imported ones. In value terms, the balance between domestic supply and domestic demand was …, as the domestic supply was able to cover …%-…% of the domestic demand in the last five years. … In the last five years, the Central and Eastern European styrene market was dominated by … and this trend will continue in the medium term. Due to the …, the market will show … in the period until 2023. Understandably, this will happen if the overall Central and Eastern European economy is able to achieve … of …% per year and…. … Under the base scenario for development, the Central and Eastern European economy will show … rates of about …% per year until 2023…. In this scenario, the annual market … rate for the period will be about …% per year, which means that the market volume in 2023 will reach 2.290 million tons or … million EUR.